Growing up in the Blue Mountains, a a couple of hours outside of Sydney, there wasn’t an awful lot in the way of record shopping options for Julia Jacklin. She had what she describes as her Christina Aguilera-phase before digging through her dad’s music collection and discovering the likes of The Velvet Underground. 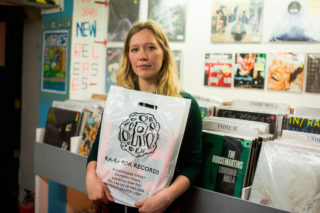 So she was pretty pleased when on a recent trip to London we took her to Ra Ra Rok Records in Camden, gave her £25 and asked her to buy a minimum of three pieces of vinyl for the latest episode of Bands Buy Records.